Council at its ﬁrst meeƟng of 2016. 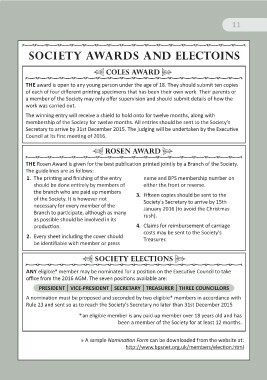 THE Rosen Award is given for the best publicaƟon printed jointly by a Branch of the Society. should be done enƟrely by members of       either the front or reverse. Branch to parƟcipate, although as many     rush). 2. Every sheet including the cover should     Treasurer. been a member of the Society for at least 12 months.